A previous article shows how to use Win32_PhysicalMedia WMI class to get physical drive info. We can write something similar for getting a list of running processes. All we have to do is to replace the WQL query and get specific properties for Win32_Process. However, to simplify the things, I wrote few C++ wrapper classes over the WMI stuff. CWMIConnection – opens and keeps a connection to WMI namespace. CWMIQuery – executes WQL (SQL for WMI) queries and navigates through results. CWMIWin32_Process – is derived from CWMIQuery and is specialized for Win32_Process. CWMIValue – a class that gets user readable strings from different CIM types. The implementation details can be found in the attached demo project. Let’s show now just a usage example, that fills a list-view control with info about running processes. // NOTE: This is just for demo purpose and can be completed. // For a compelte list of Win32_Process properties, see MSDN documentation. The demo project is a simple MFC dialog-based application that uses WMI wrapper classes to list and get info about running processes. This entry was posted in MFC, Windows API, WMI and tagged mfc, Processes, Windows API, WMI on 2013.12.16 by Ovidiu Cucu. The previous article shows how to get manufacturer-provided serial number for a physical drive by calling DeviceIoControl function. 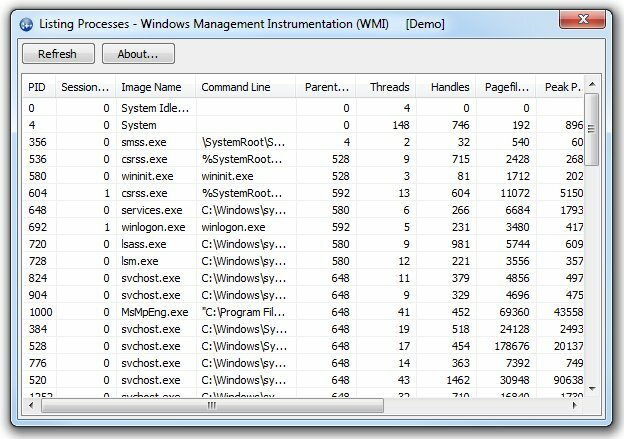 Now, let’s see how can it be made by using WMI (Windows Management Instrumentation). Set the default process security level. Create a connection to WMI namespace. Set the security levels on WMI connection. Execute a WQL (WMI Query Language) query to get a list of physical media. Each list element contains a tag as unique identifier (e.g. PHYSICALDRIVE0) and the manufacturer-provided serial number. Get each enumerator element until find the desired physical drive. For detailed code, see the complete demo application, below. Putting all together with some helpful ATL stuff, we can make now a simple console demo application. // ConsoleWMI.cpp : Defines the entry point for the console application. // Format physical drive path (may be '\\.\PhysicalDrive0', '\\.\PhysicalDrive1' and so on). We can simplify a little bit the above example by adding WHERE clause in the WQL query. // Format physical drive path (may be '\\\\.\\PhysicalDrive0', '\\\\.\\PhysicalDrive1' and so on). // Note: backslash is used as escape in WQL, so we need to double each one. // 6. Get first enumerator element. If exists, get the serial number. This entry was posted in ATL, Windows API, WMI and tagged atl, Windows API, WMI on 2013.10.27 by Ovidiu Cucu.